If you’re like 75% of smartphone users, you bring your lil’ pocket computer with you into the bathroom. And you probably touch it with your greasy fingers mid-meal all the time, too. And of course you take it on subway, and to the airport, and the movie theater, and to endless other public places where other germy disgusting human beings are present. This is less about the risk of electrocution and more about avoiding doing accidental damage to your device. If your phone's turned on while you're forcefully wiping it down you could screw with the display. Samsung totally nailed the whole water-resistance thing with the new Galaxy S7; unfortunately, the iPhone is still a huge baby, and even tiny splashes of water can hurt it. To protect your display from even the slightest exposure to moisture, never ever drop liquid directly onto the screen while trying to clean it. It’s tempting to want to swipe your sweaty fingerprints off the screen with a paper towel, but that’s a bad plan. Anything that produces lint (like a tissue, paper towel, toilet paper, etc.) can be abrasive, and can scratch your screen. 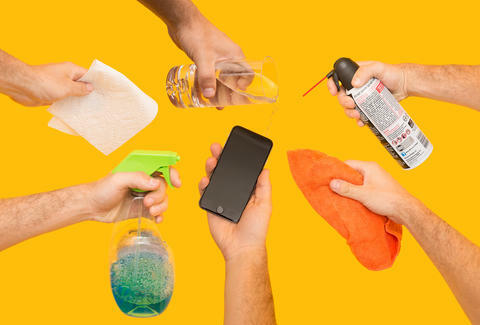 Spritzing your screen with Windex or some other household cleaner (or aerosol) may seem like a brilliant way to get it squeaky clean, but that is one of the worst things you could do. Here’s the deal: your phone’s screen has a special oleophobic coating on it, which helps the screen repel greasy fingerprint smudges. Subjecting it to chemicals will prematurely diminish its effect. Always use a microfiber cloth -- if you’ve misplaced the one that came with your phone, they’re easy enough to find (you may even have one in your glasses case). If you've got more than just smudges on your screen and need a little moisture, it's OK to use a damp cloth (read: not soaking wet) and gently Mr. Miyagi your way across the screen. Just make sure you don't get any moisture into any exposed openings. That requires being extra careful around the headphone jack, power jack, microphone, and speaker holes. So how are you supposed to clean the pocket lint and other gunk out of recessed parts of your device? The wooden toothpick trick is pretty reliable, but you should also consider investing in a canister of compressed air. Not only will it safely blast out the dirt and dust from your phone, but it will also effectively clean out your laptop's nasty keyboard crevices. Joe McGauley is a senior writer for Thrillist and terrified of what weird bacteria is lurking under his Home button.